The original AIR Creative FX collection has been included as part of Pro Tools since Version 8 and is considered the reference FX suite by some of the world’s most respected audio professionals. With MPC 2.4, this legendary suite of 16 mix essentials has been ported to MPC for immediate use with standalone or desktop MPC software; this core range of effects has also been expanded to include 12 new plugins, including the AIR Channel Strip and AIR Transient. Each effect has been expertly designed with ease of use in mind and the stunning new TUI layouts take using effects inside MPC to a whole new level. • AIR Distortion: Instantly adds colour to audio signals with multiple modes, and scalable amounts, of distortion. • AIR Enhancer: Enhances the low and high broadband frequencies of an audio signal. • AIR Ensemble: Applies fluid, shimmering modulation effects to the selected audio signal. • AIR Filter Gate: Highly-acclaimed plug-in that chops an audio signal into staccato rhythmic patterns with variable filtering, amplitude, and panning. • AIR Flanger: Applies a short modulating delay to the selected audio signal. • AIR Freq Shift: Shifts the audio signal’s individual frequencies, creating a unique effect. • AIR Fuzz-Wah: Adds colour to an audio signal with various types, and varying amounts, of transistorlike distortion • AIR Kill EQ: Instantly mutes the Low, Mid or High broadband frequency range independently from an audio signal – a popular effect with DJs and is commonly heard in contemporary electronic music production. • AIR Lo-Fi: Bit-crush, down-sample, clip and rectify the selected input signal. • AIR Multi-Chorus: Applies a thick, complex Chorus effects to an audio signal. • AIR Non-Linear Reverb: Applies a special gated or reversed Reverb effect to the audio signal, creating a synthetic, processed ambience. • AIR Phaser: Applies a phaser to an audio signal for that much sought-after “wooshy,” “squishy” sound. • AIR Reverb: Applies Reverb to the audio signal, creating a sense of room or space – perfect for Effect Send inserts or Main Effects inserts. • AIR Spring Reverb: A faithful emulation of the classic spring reverb sound. • AIR Stereo Width: A useful plug-in that creates a wider stereo presence within the source audio. • AIR Talkbox: Instantly add voice-like resonances to selected audio signals. • AIR Channel Strip: Specially written for MPC this channel strip combines multiple sections with a super-fast interface for getting incredible results. The equalisation section features a high-pass filter, low shelf, high shelf, and a fully parametric mid-band. The dynamics section includes AIR compressor and gate algorithms, which are perfect for achieving hard-hitting drum sounds. • AIR Compressor: A production mainstay. Use this Compressor to change the dynamic range of a signal by automatically reducing its gain if it exceeds a certain level. • AIR Delay: A classic stereo delay featuring a feedback path that has a filter within it to shape the tonality of the repeats. The Ratio and Width parameters enable you to achieve a wide range of stereo delay effects. • AIR Diff Delay: Delay line effect that is synchronised to the session tempo and uses an adjustable amount of diffusion, thus emulating the dissipation of echoes in reverberant space. • AIR Filter: Applies a filter to an incoming audio signal and then applies a selectable type of distortion and reduction to the filtered signal. • AIR Maximizer: A limiter specifically developed for professional mastering. • AIR Noise Gate: A classic gate effect with a dedicated denoise section to achieve a smoother gate effect with less audible chatter. • AIR Para EQ: Four-band parametric equaliser with four independent EQ ranges. • AIR Pitch Shifter: Transpose the pitch of incoming audio; a range of pitch shifting algorithms gives you a variety of flavours to experiment with. • AIR Pumper: Pumper creates a rhythmic pumping effect, similar to that of sidechain compression, with an assignable speed, depth and envelope shape. • AIR Transient: Add more attack to drum sounds, reduce the level of reverb or increase the sustain level a bass guitar. • AIR Tube Drive: Emulates the sound of the signal being played through a mildly “overdriven” tube amp, creating a warm, smooth-sounding distortion. 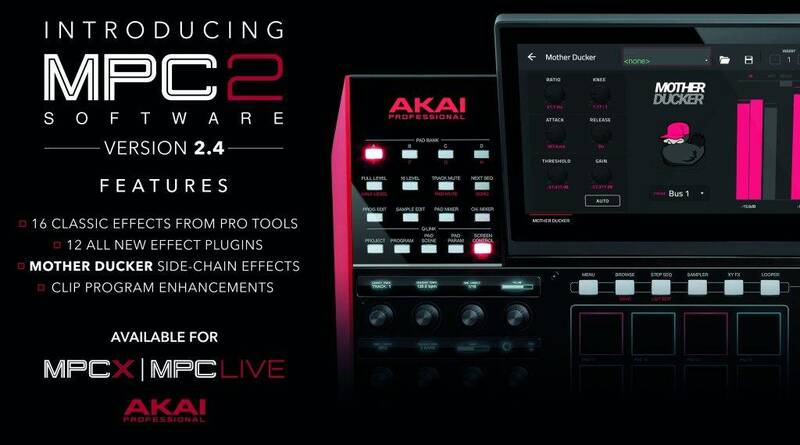 Previous NAMM 2019 – Native Instruments Releases New Gear! Next NAMM 2019 – PreSonus Announce NEW USB-C Studio Interfaces!